This is a high resolution satellite image taken today 15 December at 20:15 by the NOAA weather satellite on its most recent pass over the UK. 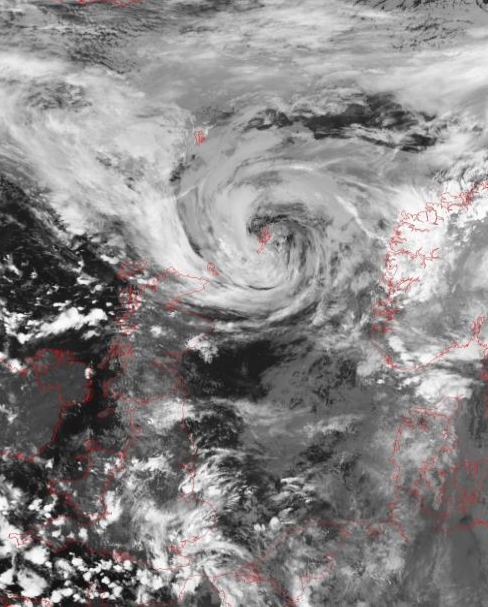 It shows a wonderful swirl of cloud over Shetland – the centre of a depression which formed over the North Sea from the front that caused the rainfall over Reigate on Friday. This LOW pressure formed on the “left-exit” region of the jetstream: those high speed winds high in the atmosphere which are so important in controlling the development and movement of depressions and anticyclones on the surface. The synoptic weather chart below matches the same period of time and shows the LOW pressure feature associated with this swirl of cloud and the attendant fronts. More on fronts and jetstreams later!